“First-Year Text” is an initiative that Loyola University instituted in 2006, in which all of Loyola’s first-year students read the same book over the summer. The book chosen for the 2018 First-Year Text is Finding Purpose: Environmental Stewardship as a Personal Calling, by Hoffman. In this book, Hoffman “invites us to look beyond material growth and explore the role of the individual and business in discovering a wider purpose to bring about a balanced and sustainable society,” according to the publisher’s description. “If there’s nothing else you remember from what I’m going to tell you today, I’d like you to remember this quote from Mark Twain – ‘The two most important days of your life are the day you are born and the day you find out why.’ You had nothing to do with that first day. Your parents made that decision for you. You have everything to do with that second day. It is your task, it is your job, it is your quest to find out that reason why you were born. That’s what you are here to do. 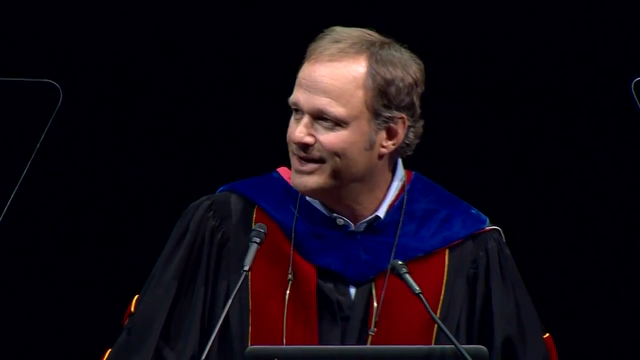 Watch the entire Convocation Address above, or click here to watch on YouTube.